A week of varied wintry weather leading up to the latest Rooker Waters Open match on the Magpie Pool had most anglers apprehensive as to how the lake was going to fish. There was no need to worry though. Just a slight rise in temperature saw a cracking match take place. 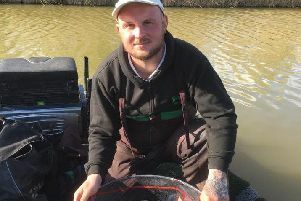 Booking his slot in the forthcoming two-day grand final was Kings Ripton-based angler Dave Rawlings. He showed the field how to fish bread, dobbing around the pads and marginal reeds from peg 26 to finish with 53 carp and a superb 143lb 10oz. Runner-up was Ben Townsend on 68lb 10oz and third was Whittlesey angler Simon Godfrey with 57lb 8oz. Top rod in the Wednesday Over 60s Open on the Magpie Pool was Kevin Peacock from peg 22. He caught early and late in the match on a maggot feeder two feet from the far bank for 34lb 10oz. John Belshaw (32lb 12oz) was second followed by Tony Dawson on 32lb 10oz. The Bower was the venue for a sweepstake organised by Yaxley, Farcet, Holme and District AC and some reasonable weights were taken. Ivan Marriott finished well clear with 8lb 6½oz of roach, skimmers and bleak, all caught on bread punch down the middle. Second was Brian Warren with 4lb 7¾oz and third John Furnell with 4lb. Mel Saggers topped Whittlesey’s final match of the season on the Queensway stretch of Whittlesey Dyke with 5lb 8oz. Jeff Tuttlebee was runner-up with 3lb 6oz and Arthur Smallman third on 2 lb 2½oz. Mick Goodman won Sunday’s match at Haddon Lodge with 15lb 1oz followed by George Bates (13lb 2oz) and Peter Telszewski (9lb 1oz).